One of the the most important things for a software development company, when dealing with a new customer, is giving them an idea of how their new system will look. It lets the customer know what to expect, but more importantly, it lets the software company know if they are on the right track. The quicker this can be done the better. So having a tool that can do this fast is pretty handy. Visual Basic and MS Access have traditionally been this type of tool, but as I've tried to show earlier, for basic back office database applications nuBuilder is even better. There is a growing trend to rent software rather than buy it (Software as a Service). It sounds like a good idea, you get to use software without paying for a server. But what happens if you decide in the future, the rental you are paying is getting out of control (you may well start off paying a licence for 5 users and eventually require 10). Now you want to take all that information and host it for yourself. You can't unless you can buy their software, good luck with that! nuBuilder can be hosted on our server or anyone elses, it can be backed up to your local drive when ever you want and if you want to move hosting providers, all you need to do is install nuBuilder (which is free) and reload your backup! This is good Risk Management. I see a lot of things calling themselves Rapid Application Development (RAD) Tools. Most of these seem to be tools for making any type of software application faster, much the same way creating a state of the art kitchen will allow any type of food to be prepared faster. But what if you just want to make a sandwich? A sandwich can have different ingredients and different flavoured sauces and can cater for any type of diet but essentially is a sandwich. Making a sandwich is something Subway has perfected - they have the buns, the meat, the vegetables and the sauce all ready to go. Ask for a Subway sandwich and chances are you'll have it in under 2 minutes. On the other hand go to a state of the art kitchen, where they can create anything and therefore make everything from scratch, and you could wait 2 hours for them to cook the exact same thing offered by Subway. Most Rapid Application Development Tools are like the state-of-the-art kitchen. 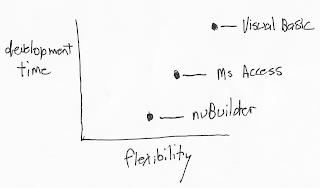 They have been designed to be able to build anything from scratch, whereas nuBuilder is the Subway of RAD development when it comes to web-based database applications. We have everything you need to make a web-based database application ready to go- Edit Screens, Search Screens, Permission Levels and the Report Writer. We even have pre-defined modules already developed, available for download from our website. This way you can even choose a sandwich that has already been made. This is the way I think RAD should work! People have probably wondered why we made nuBuilder available for free. After all, they say "There is no such thing as a free lunch". With nuBuilder there is such a thing as a free lunch, the only thing is that you have to make the sandwich yourself. So why would we give it away for free? Well we hope that every now and then someone will ask us to make their sandwich for them. Along with all the child records in any subforms on the Edit Screen.